Plantronics Replacement Wireless Headset for W420 W720 is basically a spare or replacement of Plantronics Spare Headset for W420 W720. It is designed to use to connect more than two people at one time with this single node like a conference call. 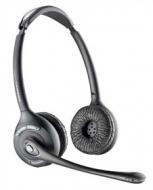 It is the replacement for the Plantronics Savi W420 W420-M W720 W720-M if their headsets have been misplaced or damaged. This headset is specially designed to roll over your head or neck, as it is durable, lighter in weight and can be carried everywhere without creating any fatigue. Three ways connectivity option is the most brilliant feature in it, and it helps you connect PC, desk phone, and mobile call at the same time by only switching from one on another. The wireless device is very intelligently used with the wide range.